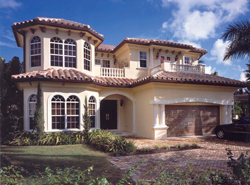 Florida style house plans mirror the design of Spanish or Mediterranean architecture with features including tile roofs, arches, stucco siding and contemporary lines. But, unlike Mediterranean or Spanish home designs, many Florida style houses use pastel hues rather than vivid ones. Although Mediterranean and Spanish style homes are popular, another type of home seen in Florida is raised on piers as seen with beach house plans. Florida floor plans are casual and relaxed with many windows and verandas for enjoying seaside breezes. One thing that all Florida home designs have in common is their durability with strong weather conditions and high humidity. The Perida Contemporary Home has 3 bedrooms, 2 full baths and 1 half bath. 2122 Sq. Ft., Width 103'-0", Depth 67'-8"
The has 5 bedrooms and 3 full baths. 3609 Sq. Ft., Width 57'-0", Depth 63'-0"
3578 Sq. Ft., Width 62'-0", Depth 76'-0"
The has 4 bedrooms, 5 full baths and 2 half baths. 7798 Sq. Ft., Width 172'-9", Depth 87'-6"
The has 5 bedrooms, 3 full baths and 2 half baths. 5463 Sq. Ft., Width 102'-0", Depth 102'-0"
The has 4 bedrooms, 3 full baths and 1 half bath. 4529 Sq. Ft., Width 63'-0", Depth 89'-0"
3262 Sq. Ft., Width 69'-0", Depth 60'-6"
Our collection of Florida style house plans encompass Spanish and Mediterranean style as well as the casual, laid-back feel of beach house designs, or coastal homes. The architectural designs of Florida house plans range from Spanish style to Waterfront, so it is easy to find the perfect Florida style floor plan and style of home ideal for the location you plan to build.